Background Pregnancy is a physiologic condition which is unique in that it alters the physiology of each organ in the body. Cardiovascular changes during pregnancy are significant and start at 6 to 8 weeks of gestation. Physiologic cardiovascular changes during pregnancy suggest the chance of altered electrocardiographic (ECG) parameters during pregnancy. 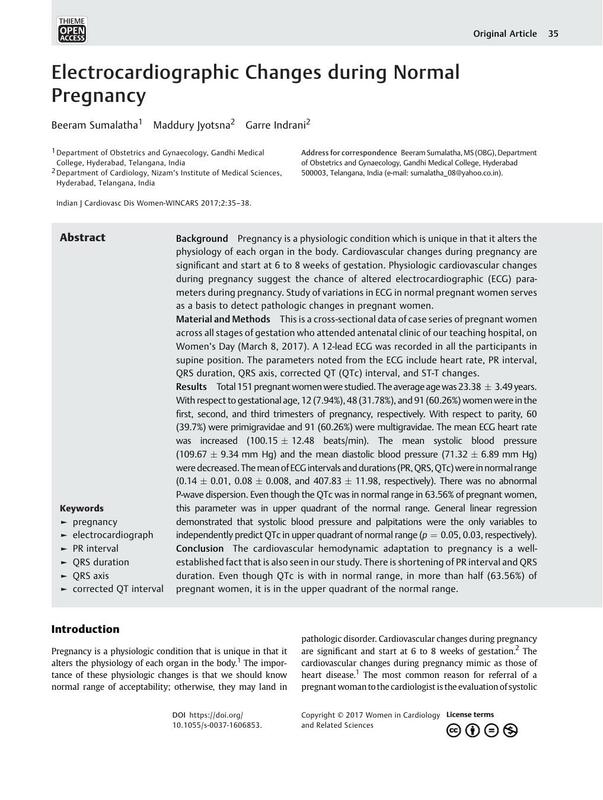 Study of variations in ECG in normal pregnant women serves as a basis to detect pathologic changes in pregnant women. Material and Methods This is a cross-sectional data of case series of pregnant women across all stages of gestation who attended antenatal clinic of our teaching hospital, on Women's Day (March 8, 2017). A 12-lead ECG was recorded in all the participants in supine position. The parameters noted from the ECG include heart rate, PR interval, QRS duration, QRS axis, corrected QT (QTc) interval, and ST-T changes. Results Total 151 pregnant women were studied. The average age was 23.38 ± 3.49 years. With respect to gestational age, 12 (7.94%), 48 (31.78%), and 91 (60.26%) women were in the first, second, and third trimesters of pregnancy, respectively. With respect to parity, 60 (39.7%) were primigravidae and 91 (60.26%) were multigravidae. The mean ECG heart rate was increased (100.15 ± 12.48 beats/min). The mean systolic blood pressure (109.67 ± 9.34 mm Hg) and the mean diastolic blood pressure (71.32 ± 6.89 mm Hg) were decreased. The mean of ECG intervals and durations (PR, QRS, QTc) were in normal range (0.14 ± 0.01, 0.08 ± 0.008, and 407.83 ± 11.98, respectively). There was no abnormal P-wave dispersion. Even though the QTc was in normal range in 63.56% of pregnant women, this parameter was in upper quadrant of the normal range. General linear regression demonstrated that systolic blood pressure and palpitations were the only variables to independently predict QTc in upper quadrant of normal range (p = 0.05, 0.03, respectively). Conclusion The cardiovascular hemodynamic adaptation to pregnancy is a well-established fact that is also seen in our study. There is shortening of PR interval and QRS duration. Even though QTc is with in normal range, in more than half (63.56%) of pregnant women, it is in the upper quadrant of the normal range.